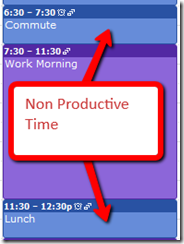 In my last post I talked about scheduling using Google Calendar. This tool allows you to have multiple calendars overlaid over one another. This allows you to see possible conflicts and to move things around to make things more efficient. The cool thing about using a calendar tool like this is to put down all the things you are currently doing and look for time areas that can be better utilized. 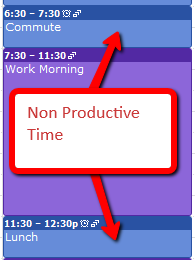 Here is an example from my daily calendar that many people have to deal with. Given our busy lives and the way most cities are laid out, many of us have to commute to work. This may be by car or public transportation. For many people this is just wasted time, especially if you have to drive. Additionally, most people have a lunch hour, which can be a time to wind down, but many times is unproductive. In the example above we have two hours out of a busy day that are not productive but with a little creative thinking could be used to facilitate a STRONG goal or other activity. Let’s look at some things we can do to make the most of this time. 1. Commute Time: One thing that has revolutionized my life over the years is listening to audio books while driving. There are thousands of educational titles available on Audible.com or iTunes that can change an unproductive hour into a mobile classroom of learning. With the addition of an inexpensive iPod or MP3 player you can take Audio books along wherever you go. Some great titles to get you started might be Getting Things Done by David Allen, Stephen Covey’s 7 Habits of Highly Effective People, or the long time classic, The Magic of Thinking Big by David Schwartz. 2. Lunch Hour: The time you have at lunch can be a great time to fit in your exercise goals. You can take a walk, climb some stairs, or go to a nearby gym and work out. Over the past six months, I’ve used my lunch hour to workout at a local fitness center. Tied in with a fitness program such as Body for Life, you can see real results in a relatively short time. The key to making a lunch hour work is to plan ahead. Bringing your lunch from home and finding things to do on your work site or nearby is key to fitting it in your 60 minute time period. While these are just two simple examples of filling in unproductive time, you can probably find many more by spending a few minutes moving things around on your calendar. While it’s good to strive for balance, planning a new STRONG goal for the new year and fitting it in to your schedule can truly make a huge difference in your life. Why not take a look at your calendar today and fit something in. A few months from now, you’ll be glad you did. Question: What STRONG Goals could you fit in to an hour of unproductive time?